A tow truck hauls a jackknifed semi truck back onto U.S. 23 North in Delaware shortly before police reopened one lane of traffic Thursday. No injuries were reported in the crash. 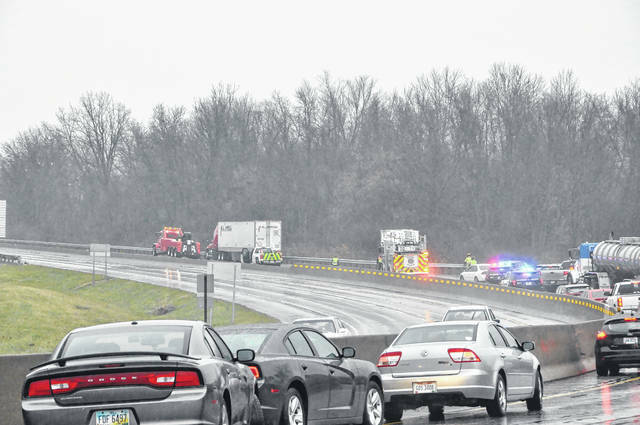 Northbound traffic on U.S. 23 in Delaware was brought to a halt Thursday morning around 11:40 a.m. after a truck jackknifed. City of Delaware police report that Octavia Devon Clemmons, 40, of St. Petersburg, Fla., was driving his 2016 Freightliner north on U.S. 23 in the area of Mingo Park when the vehicle jackknifed, causing damage to a guardrail and blocking the road. Clemmons was not injured in the crash, but the the truck did block both lanes and the on-ramp from East Central Avenue, causing traffic in the northbound lanes of U.S. 23 to halt. A lane of traffic was reopened after a tow truck brought the truck back onto the road and after a short time, all lanes of traffic were reopened. The East Central Avenue on-ramp to U.S. 23 North was closed for the duration of the crash and clean-up. Police report Clemmons was issued a summons to Delaware Municipal Court for failure to maintain reasonable control of his vehicle.